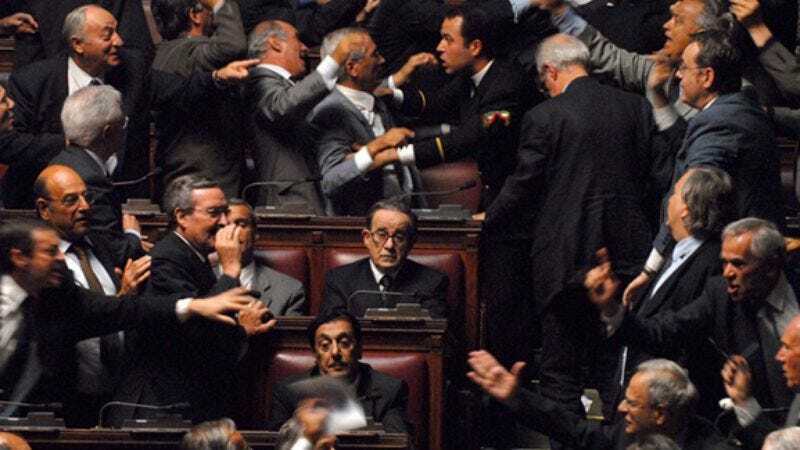 Paolo Sorrentino’s outrageously stylized historical commentary Il Divo opens with a flurry of pre-credit titles intended to bring viewers up to speed on Italian politics in the latter half of the 20th century. No matter. For those who don’t come into the film with a wealth of knowledge on the subject—specifically, the 50-plus-year career of Italian Prime Minister Giulio Andreotti—there’s little hope that the frenetic goings-on in Il Divo will be remotely comprehensible, especially in the hands of a mad conductor like Sorrentino. That isn’t entirely a slight against the film; after all, it’s an Italian production pitched to an Italian audience, who likely don’t need a primer on their own recent history. But Sorrentino’s directorial flourishes are at least partly to blame for the lack of clarity; his ornate setpieces are frequently dazzling, but as they pile up over two hours, they wind up distracting as often as they illuminate. Then again, perhaps some confusion is in order, because Andreotti, as played brilliantly by Toni Servillo, seems to have survived on politics on the strength of his cool inscrutability. During his four decades at the center of the Italian political scene—he currently serves as “Senator for Life”—the diminutive, elfin Andreotti was nicknamed “The Hunchback,” “The Sphinx,” and “Beezlebub,” among others, and had a talent for slipping the noose. Il Divo catches up with Andreotti’s seventh government in the early ’90s, when he and his long-dominant Christian Democrat party finally got snagged in the “Bribesville” scandals that connected them with mass corruption, high-profile murders, and mob ties. Sorrentino tags Andreotti as the ultimate political animal; in one scene, he explains that the reason he confides in a priest instead of praying directly to God is because priests vote. Il Divo doesn’t offer any smoking gun—nor should it, considering how Andreotti managed to elude several prison sentences on appeal—but there’s plenty of guilt by association, tied to an endless procession of killings and suicides. Through Sorrentino’s lens, Andreotti’s chief lieutenants are made to look like Reservoir Dogs, with Andreotti as a calm, tight-lipped, upper-crust analog to Lawrence Tierney. Il Divo tarnishes his legacy convincingly but not clearly, which is probably appropriate for a politician renowned for his opacity.